I still run the blog of my kindergarten and there I told yesterday how the multicolored tulip came about. For our little researchers, we are always on the look-out for experiments that they can do themselves. This time it should illustrate the water system of a flower! 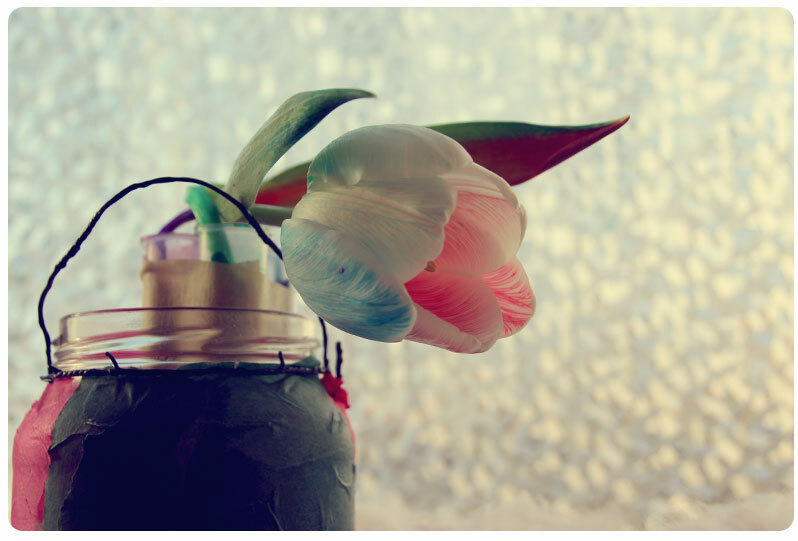 (My colleague got tulips and ink, cut the flowers at an angle, and showed the kids what it looks like. The children were now allowed to put their tulips in the glasses with the colored ink. It is more difficult if you want to have a multi-colored flower. We had to help then. wunderschön ist Deine Kinderhort-Seite und den Beitrag habe ich natürlich gelesen und bin genau so begeistert, wie es "Deine" Hortkinder waren. Habe ich doch gleich mal nachgelesen und klasse habt ihr es gemacht, wie man auch hier sehen kann. Auch mal eine Idee eine Tulpe ganz besonders einzufärben um sie zu verschenken.